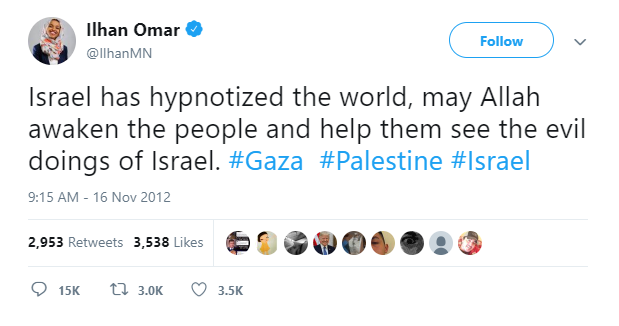 Congresswoman Ilhan Omar is perhaps best known for her Tweet attacking Israel using words borrowed straight out of the Protocols of the Elders of Zion. So fast forward to the Covington Catholic School story. Black Hebrew Israelites is listed by the SPLC as a hate group. Vox tried to whitewash the group, calling them a “a rarely discussed religious group,” but couldn’t ignore the SPLC’s description of them. The SPLC refers to them as an “extremist sector within the Hebrew Israelite movement whose adherents believe that Jews are devilish impostors and who openly condemn whites as evil personified, deserving only death or slavery,” and also have a history of sexist and anti-LGBTQ remarks. Given what we’ve seen on video, that description is accurate. So once again enters Congresswoman Ilhan Omar. That Tweet is from yesterday. More than 24 hours after all the details came to light. Her facts are wrong, the boys did not taunt the Black Hebrew Israelites. But it is noteworthy that the people she rushed to defend AFTER every other media outlet started to cover the whole story, is the one group that called Donald Trump a homosexual, called the boys faggots, and calls Jews in Israel lying devils. I guess the Freshmen class of Democrats found one type of Israeli they like, the black supremacist cult that hates white people, Catholics, and Jews. Someone needs to update her Wikipedia profile….. But, but, I thought the lefts propaganda was that they were “inclusive”. I guess that was just for PR purposes and she just let the truth of her “convictions” slip out,that she is a member of a black supremacist cult that hates white people, Catholics, and Jews. Not what we need in congress representing the American people. Glenn Beck doing the mainstream media’s job (yeah I know Glenn Beck), has a complete timeline on “The Blaze.” It turns out that the Black Hebrew Israelites were shouting obscenities at the Native American agitators. The Covington boys were milling around waiting for their bus back home. The BHI switched to the few Covington boys who were wearing MAGA hats. The obscenities increased in both vitriol and volume. The Covington boys responded by shouting school pep chants to drown out the BHI obscenities. This is when the Native American agitators came over to one of the Covington boys and began shouting and banning a drum in the face of the MAGA hatted boy. The boys made no physical moves, they just stood there, one with the smirk saw ’round the world.